The North Dakota State University Libraries’ Germans from Russia Heritage Collection (GRHC) is pleased to announce sponsorship of the 23rd Journey to the Homeland tour to Germany and Ukraine, May 15-25, 2019. 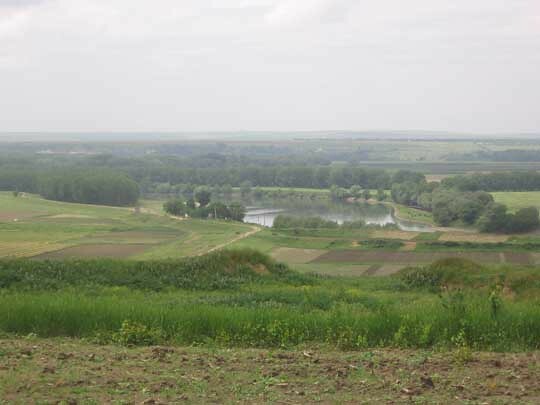 This tour offers travelers the unique opportunity to visit the villages of their German-Russian ancestors near Odessa, Ukraine. Tour members will walk where their ancestors walked and have their eyes opened to village life. Leading the tour will be Michael M. Miller, GRHC Director, and Jeremy Kopp, GRHC Outreach & Operations Coordinator. Registration for the 2019 tour is full! More information and exact dates for the May 2020 tour will be available in late July 2019. Registration will be available in late August 2019. *You may wish to depart earlier to ensure an on time arrival in case of any flight delays. **Travel to the former Crimean, Volga, Mennonite, Volyhnian and Hutterite villages are not included in this tour. *International airfare is not included. See 'Airfare Information' tab below for more information. Registration for the 2019 tour is now full. More information and exact dates for the May 2020 tour will be available in late July 2019. Registration will be available in late August 2019. Please be aware that our tour fills up very quickly and it is recommended that you register as soon as possible after registration opens. Initial registration deposit is due immediately upon registration and all registrations must be completed online. The tour registration deposit must be made with Visa, MasterCard, Discover, or Electronic Check (ACH). All additional payments cannot be made by credit card and must be made by Check, Money Order, or Electronic Check (ACH). ACH payments can only be made from United States bank accounts. Once payment options are available, there will be links in the "Make Payment" column in the above table. Late payments: All late payment will be charged a $50 fee. Should a reservation need to be canceled for any reason, a full refund less your $600 per person deposit will be made for cancelations received prior to March 1, 2019. If a cancelation is received after March 1, 2019, there will be no refund given. If we do not secure 20 paid registrations before February 1, 2019, we will be unable to offer the tour and you will receive a 100% refund. The flight from Berlin to Odessa and returning from Odessa to Stuttgart is included with the tour price. We will use your registration information to book group airfare for this flight so it's important that you accurately register with your name EXACTLY as it appears on your passport, current passport number and expiration date, and your birth date. International airfare is not included with the land tour price and must be purchased separately. Details regarding airfare booking will be provided to tour members upon successful registration and once registration deposit is received. Cost of international airfare will vary depending on your departure city. Once you have successfully registered, please book your international airfare at your convenience. We recommend booking with Cheyenne at All Travel Matters at 701-891-8135 or cheyenne@alltravelmatters.com. Cheyenne is familiar with our trip itinerary and can best assist you in this process but you may book your airfare on your own. Arrival: In Berlin, Germany, before 3pm on arrival day. Departure: From Stuttgart, Germany, any time on the final day. We recommend after 10am if you are able. Airfare tips: The tour begins in Berlin on Arrival Day with a Welcome Supper at 6pm. We recommend arriving in Berlin before by 3pm on arrival day so you are able to check-in to your room and get settled. Additionally, if you are able, we strongly recommend arriving in Berlin at least one day early so that no group activities are missed if your scheduled flight is delayed for any reason. In the past, we’ve had tour members scheduled to arrive on arrival day and their flights were delayed until day 2. All hotel accommodations for early arrivals or late departures must be booked on your own (we can provide recommended hotels). Once you have booked your airfare, please provide your itinerary information to Jeremy Kopp at 701-231-6596 or Jeremy.Kopp@ndsu.edu. It was a rewarding experience on many different levels - spending time with other people with the same background and on the same quest, learning more about the history and current situation in the Black Sea area, as well as seeing, meeting and talking to people from the area were worth the trip. Indeed, we are blessed that our ancestors had the courage to leave home and family to seek a new life in an unknown country and thrive! Again, thank you for all the effort you put into this trip and preserving the culture of the Germans from Russia.